I love the LTUX leadership events. They are so inspiring and motivational and I have been to all of them so far so I could not miss this one titled 'Leadership: Advice to Your Younger Self'. 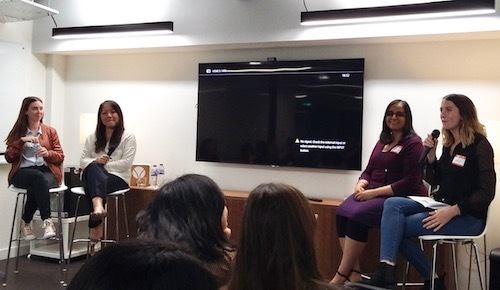 There was a panel of three leading ladies, Tarnjit Tiyur, Sammy Kingston and Christine Hoover Lanuy chaired by Amy Shore from Foolproof who hosted the event. It is hard to give you a blow by blow account of what was discussed, especially the personal stories that were shared, but I can pull out my favourite take aways. These include, making the most of opportunities as they crop up and making sure you take people along on your thought journey. The fact that not everyone will love you, but if they did you are probably not doing your job right. You should lead by example, you cannot force people to change; in fact you cannot change a personality but you can request someone change their behaviour. Do not worry about mistakes, but learn from them, after all in most of our jobs no one will die from our mistakes. Learn to say no, remember to take breaks and be kind to yourself. Leadership is not a solo thing, but works with a team to support you. And most importantly, if a job is making you ill, it does not matter how 'amazing' that job is or how 'brilliant' the money is etc, leave. I am not sure if these ladies realise quite how inspiring they are to people like me, but I really appreciate them taking the time to come and speak at events like this. Sadly with Christmas in the way I do not think I will be back with LTUX until Feb 2018 now.